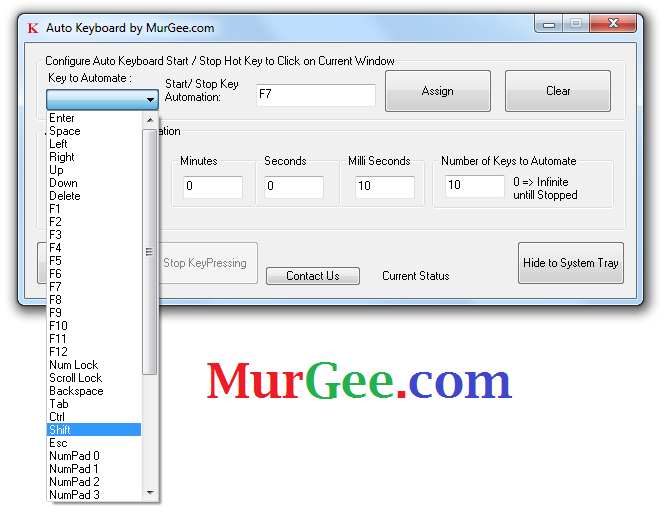 Want to automate specific single key on keyboard to be automatically pressed as configured, Auto Keyboard by MurGee is the Software utility for you. This Keyboard Automation Software can be used as a bot or a macro whenever required. You can download the Auto Keyboard Software right now and use it within a matter of few minutes. Yes there are hardware alternative options available with the name of programmable keyboard which can be little bit of expensive as compared to a software solution. Moreover as a programmable keyboard is a hardware device, it will take some time for you to find an appropriate hardware bot and get it delivered to your house. This Auto Key Bot Software can be used by simply configuring a shortcut key or hot key combination to automate key pressing and releasing of any other selected key. As the screenshot displays, the Auto Keyboard Software provides a selectable list of keys. Whether you want to automate function keys, keys on numpad, scroll lock, enter key , spacbar, arrow keys, ctrl key and lot other keys , this bot software can be of real help. Just select the appropriate key from the list of keys on keyboard that can be automated and then specify another shortcut key combination to simulate or automate key to be pressed on keyboard automatically. Yes you can use this Keyboard Bot for Windows 8, Windows 7, Vista, XP and any other version of Windows. Download the software now and let this Auto Key Bot to simulate or automatically press the configured key on keyboard. In case you would like to type long sentences on keyboard on the press of a single shortcut key on keyboard, then Auto Keyboard Typer might be the software of use to you. The Keyboard Automation Software presented here is an easy software and does not create any type of macro and does not require any sort of programming, just use the easy to use graphical user interface and that is sufficient to turn this Auto Keyboard software to turn it into a powerful auto keyboard bot for your windows computer.